Looking for a special dessert for Valentine’s day? How about one from chef Nathan Lyon – host of Good Food America on Veria Living and author of “Great Food Starts Fresh”? Chocolate Truffles Four Ways!! Nom. Nom. Nom. 1. Pot the cream into a medium saucepan and stir slowly over medium-low heat to just a simmer, being careful not to let it boil. 2. Combine the chopped chocolate, butter, and salt into a large bowl. Remove the cream from the heat and pour it over the chocolate mixture. Cover with plastic wrap. 3. Let the mixture sit undisturbed for 1minute, then uncover and slowly stir with a spatula until fully incorporated. Stir in the vanilla extract. 4. Divide the melted chocolate evenly among 4 small bowls. Add the dark run to the first bowl, the orange oil to the second, the almond oil to the third and the peppermint oil to the fourth. Cover each bowl loosely with plastic wrap and refrigerate until firm, approximately 1 ½ to 2 hours. 5. Using a melon baller, small ice cream scoop, or teaspoon, scoop the chilled chocolate into one-teaspoon portions. 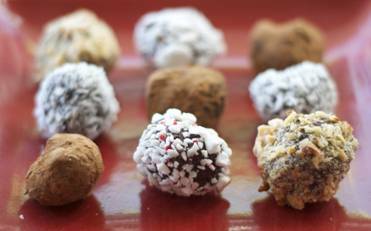 Quickly roll each portion of chocolate between the palms of your hand to achieve a somewhat round ball. 6. Gently roll each chocolate ball in one f the four separate bowls filled with the cocoa power, mint candies, shredded coconut, and toasted almonds. 7. Transfer the coated truffles to a parchment paper-lined plate, cover loosely with plastic wrap and refrigerate until firm, approximately 30 minutes. Remove truffles from the refrigerator 15 minutes before serving. Note: Enjoy a little heat with your chocolate? Try stirring in some ground cayenne pepper with some melted chocolate. Whoa! Spicy.